"Blazing Famiglia" centers around a family of former teenage gangsters. Tetsu Hino (Yoshimi Tokui) was once the leader of the most feared motorcycle gang in the Kanto area. Now, Tetsu Hino is middle-aged man who is looked down upon by his rebellious son Shuhei (Kento Hayashi). One day, Tetsu and his old biker gang gather together again after the daughter of a member is assaulted. Tetsu, worried about his day to day life, nevertheless regains the passion from his biker days. Tetsu then finds out that Ken Igarashi (Jun Murakami) is the man behind the attack. Ken Igarashi has had a grudge against Tetsu for a long time. 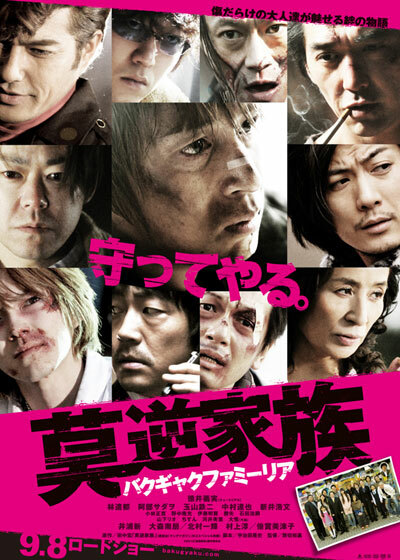 gagaga Jul 16 2011 9:32 pm Ooooh interesting, i love movies that have story lines about gang lords, crimes etc.. Us common people can get glimpse of the underworld and their secrets.